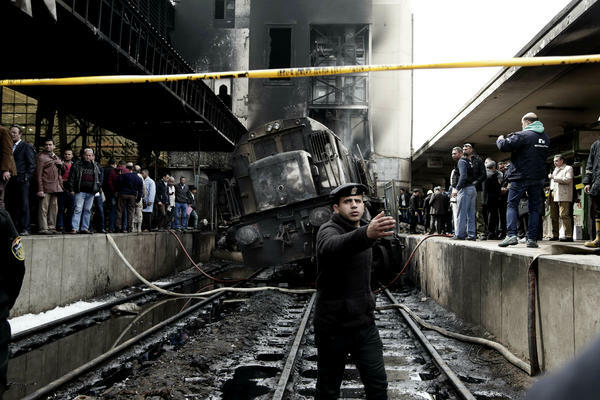 Policemen stand guard in front of a damaged train inside Ramses train station in Cairo, Egypt, on Wednesday. "The fire overwhelmed them and they ran while they were on fire until they fell meters from the incident," witness Ahmed Abdeltawab told Reuters. "The scene was terrifying." Surveillance video, widely shared on social media, shows people calmly walking through the train station. Suddenly they start running as flames blast through the area, engulfing the crowd. One man is seen fleeing while completely on fire. He desperately runs up and down a set of stairs, and another man tries to help him by dousing him with water. Egyptian Transport Minister Hesham Arafat has tendered his resignation because of the incident, according to Egypt's state news wire, and the prosecutor general has ordered an investigation into the fire. Questions remain about what led to the train locomotive crashing into the barrier. A general railway instructor, Ashraf Momtaz, told The Associated Press that at this point it's not clear there was a driver aboard when it crashed and it's possible they could have jumped out. "The railcar takes time to (gather) speed so there is a chance that someone set it on full speed before leaving," Momtaz told the wire service. Regardless of how it happened, he said that the crash suggests "negligence from the driver and supervisors." The Ramses train station, located in bustling downtown Cairo, is a hub for travel across Egypt. It's a country where deadly train accidents are tragically frequent. As the AP notes, "Official figures show that 1,793 train accidents took place in 2017 across the country." President Abdel-Fattah el-Sissi said last year that the country doesn't have the budget to fully revamp the poorly maintained train system, the wire service added. But recently, according to local media, the Railway Authority has tried to introduce some new safeguards to prevent accidents. In 2017, a train collided with another near the coastal city of Alexandria, killing more than 40 people. And in 2012, some 50 children were killed when a train crashed into their school bus in central Egypt.